Using aluminium micro-channel heat exchangers in the outdoor units of the YLM VRF system is the main contributor to an annual energy saving of up to 27% compared to previous systems. Without waiting for a delayed EU Ecodesign regulation to come into effect, Mitsubishi Electric is poised to launch the latest version of its City Multi VRF air-conditioning system — with major improvements in annual energy consumption. 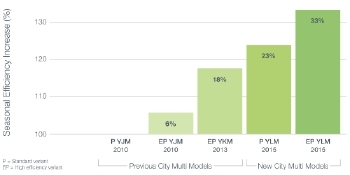 The seasonal energy efficiency of Mitsubishi Electric’s City Multi VRF air-conditioning systems has been increasing by leaps and bounds since even as recently as 2010. Driven by EU Ecodesign regulations, the company has been working on technology innovations and enhancements that together offer up to 27% annual energy saving in compared to the previous equivalent City Multi systems. The YLM range will become available in Europe at the start of next year, when the relevant Ecodesign regulation was due to come into effect but which has been pushed back to 2017. Mitsubishi Electric was already working towards the earlier date, and has started production in Japan in readiness for the earlier date. A cursory glance by a practised eye at an outdoor unit of the new range will immediately spot the main contributor to the improved efficiency and reduced energy consumption. It is the heat exchanger, which now uses aluminium micro-channel tubes rather than copper tubes. What is not externally visible, however, it that each micro-channel tube has six tubes within it, rather than one for copper, and that there are four of these tubes in the space taken by three copper tubes. The new design of coil contributes to the reduced weight and footprint of YLM VRF outdoor units. The new design of heat exchanger also achieves 26% more contact between the tubes and the fins. Heat is more easily rejected and absorbed, so the compressor does not have to be run as hard. The new coil design also reduces the weight and footprint of the outdoor units. Refrigerant charge, the refrigerant is R410A, for a system is 10% less — which is significant for systems affected by EN378 restrictions on the concentration of refrigerant in a space if there should be a leak. The reduced refrigeration content means that there can be more units in a system. There are corrosion issues associated with aluminium but these have been addressed using a sacrificial zinc coating. The coating has been tested to the equivalent of 30 years by a Japanese standard, demonstrating its ability of coping with the UK’s temperate climate. The compressor for the YLM range is specifically designed to maximise efficiency at part load. Mark Grayson, air-conditioning product manager in the UK, reminds us that peak load occurs for only 5% of the year — so part-load efficiency is the key to maximising seasonal efficiency. Another feature of the new compressor is the use of induction heating rather than a crankcase heater, which halves the use of energy for this purpose. The bellmouth grille at the top of the outdoor units has been redesigned to aid airflow, reduce static pressure and reduce the energy consumption of the new DC motor for the fans. One issue when using a VRF system in heat-pump mode to provide space heating is the loss of heating capability when the outside coils need defrosting. For the benefit of the European market, the YLM range offers hot-gas defrost. If there is only one outdoor unit, one half of the split heat exchanger undergoes hot-gas defrost while the other half continues to deliver heat. Hot gas defrost operates down to an outdoor temperature of 1°C. Below that temperature, reverse defrost is used. In systems with two or three outdoor modules, one module can have its coils defrosted using hot-gas defrost while the other module(s) continue to deliver heating. With a modular system, hot-gas defrost can operate down to an outdoor temperature of -5°C. Below that temperature reverse defrost operates — which covers most of the winter season. Moving indoors, City Multi YLM indoor units can be controlled in a manner to maximise comfort and reduce energy consumption. This approach to control acknowledges that the temperature UK climate often demands close control of capacity — both sensible and latent — as well as off-coil temperatures. In just five years, the seasonal efficiency of Mitsubishi Electric’s City Multi VRF air conditioning will have increased by a third. Allowing the evaporating temperature on an indoor unit to rise as set point is approached increases the sensible heat factor and improves seasonal efficiency by 8%. There are two approaches to controlling indoor units. One is automated dynamic control of the evaporating temperature of the refrigerant based on internal heat load, which is particularly useful in open-plan offices. 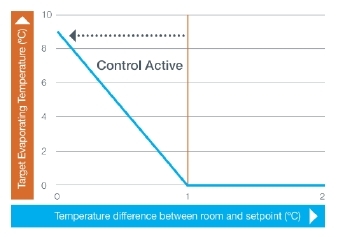 When the indoor temperature is within 1 K of setpoint, the evaporating temperature is allowed to rise, increasing the air-off temperature and boosting efficiency. This feature alone increases seasonal efficiency by 8%. The other approach is to increase and fix the evaporating temperature of the system to increase the sensible heat factor to raise the air-off temperature and, thus, efficiency and comfort. As with all City Multi VRF systems, this latest system uses 2-pipe heat recovery. Compared with a 3-pipe system the number of connections is a third less. There are some optional add-ons to make use of rejected heat. One is a door curtain. The other is the delivery of domestic hot water at up to 70°C. 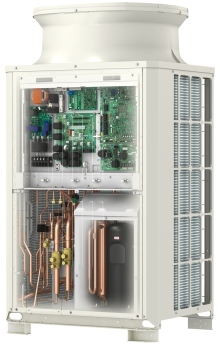 The YRM range comprises outdoor units with cooling capacities from 22 to 101 kW in both heat-pump and heat-recovery variants. Up to 50 indoor units can be connected to the largest model. The reduced footprint made possible by the new coil design is reflected in the dimensions of the smallest outdoor unit — 740 x 920 x 1710 mm — enabling it to be transported in a standard building lift.